There are a number of essential steps one must take when beginning their journey into the world of launching a business. They are faced with a variety of tough decisions that could make or break the business, or at the very least, hinder its future success. One such choice that seems to be commonly overlooked by many fledgling business owners is the selection of the company’s domain name. Selecting and registering a domain name for your company is extremely important. While this is a seemingly small decision that many think can be pushed aside until one has the time, this delay fails to recognize how integral an optimal domain name can be for the success of one’s online presence. A creative domain name can create brand authority, customer retention, and help one product stand out in a sea of competitors offering a similar product or service. This is a process that should not be taken lightly; it is not something that can wait until the last minute because if you do rush it, you may end up being stuck with a boring name that hinders more than helps. So, when thinking of a domain name, you need to invest the time, and you need to get creative. Below we will discuss the benefits of a creative domain name, share some tips on how you can get creative, and hopefully help to give your online business the edge it needs to not only succeed but thrive. Before we begin, it is vital that you know the basics of how domains function with websites. If this is your first online business, odds are this is the first time you have had to consider how websites function on the worldwide web. Computers on the web locate and communicate with each other using a series of digits and periods known as Internet Protocol Addresses. This IP address is unique to every computer and website, and to find another computer or website, one would have to type in this unique numerical address. For the layman, a good way to mentally picture a website is as a digital storefront; an amalgamation of files, data, pictures, and pages, which result in the final product you see on your screen when you type in NYTimes.com. Like an actual store, say a Starbucks or a Costco, these web pages have a virtual address (the IP) which helps distinguish them from the billions of other web pages. As you might imagine, while this would not be an issue for the computer, at best, it is an inefficient method for human navigation, since there is simply no way we humans could memorize all the IP addresses of every website. Even having an online phone book of sorts would be painfully inconvenient. Computer scientists recognized that this was not the best method for navigating the web, so they decided to create a shorthand of sorts, building the domain name system and fashioning a registry that linked any registered domain name with its unique IP address. .com – shortened for commerce and commercial. This extension is the most popular by far and as a result, used by both small and big businesses. However, this extension has the fewest available domain names to choose from. .net – the second most popular extension, generally used by network providers such as Timewarner.net. .org – organizations’ domain name, such as freethedolphins.org. .edu – the domain extension used by educational institutes and universities. .gov – domain name for governmental agencies, agents, or officials. .mil – American military domain. Before you start thinking about how much a domain name costs, there are a few steps you should follow first. Picking the perfect domain name should be the first step you take when it comes to planning for a successful online business. This name will function as your business’ online identity. So, a proper name will act as a reflection of your brand; it will answer who you are as a company, and it will hopefully indicate either the product or service you are offering to new customers. Thanks to the domain name registrar system, no two domain names can be identical, so, this is your opportunity to truly define who you are as a business. Therefore, picking the right name—a creative, catchy name—is vital. If you were buying a brick and mortar store, odds are you would put an incredible amount of time and research into the various options. You would scout each location, get estimates on how much traffic they attract, and find measurements on how the previous businesses have operated. You would weigh the pros and cons, and compare that to the costs associated with each location. Only after some serious time and thought went into the process would you then select the final resting spot of your business. Like opening a brick and mortar store, when selecting a domain name, you should treat what some view as a tedious process with the utmost respect. Do not do this haphazardly, instead invest the time to land the perfect domain name. 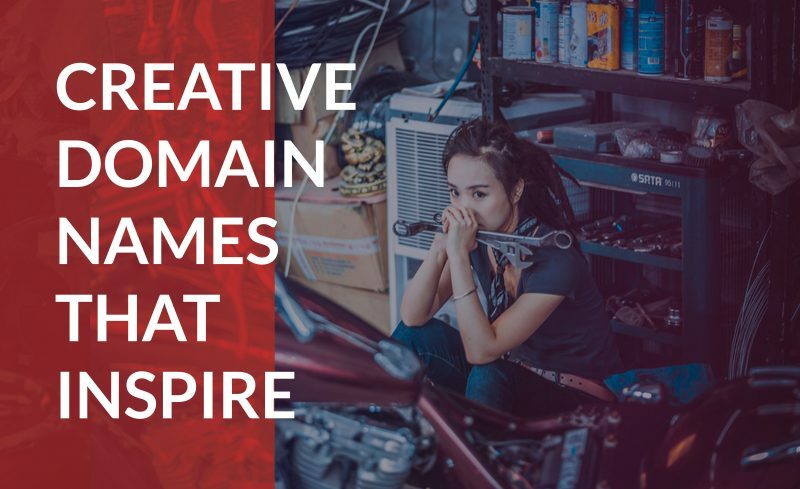 While there are a variety of methods for brainstorming a creative domain name, as a general rule of thumb, there are two directions to choose from that you will want to consider before you get into the nitty-gritty. They are keyword rich domain names and brand-centric domain names. Keyword rich domain names are domain names that place emphasis on certain SEO keywords or phrases that may be used to describe a business’ rendered product or service. Employing this strategy generally consists of creating lists of keywords or phrases that act as descriptors of the company or what it is you are selling. These descriptors should not only reflect what you offer but do so in such a way to distinguish you from your competitors. Keeping search engine optimization in mind is also wise, so look to use words or phrases people are randomly searching for your product, or something similar that someone might organically type into the search engine. Brand-centric domain names are often meant for businesses that have previously established their name or brand within the market. At this point, customers know these brands, know what they are selling, and can likely remember their catchphrases or slogans. Brand-centric names include Amazon.com, Facebook.com, Adidas.com, and a whole host of other powerhouses. For a company like Staples, it would make sense for them to purchase the domain name, “Thatwaseasy.com” since they are recognized by that tagline. While brand-centric domain names are ideal for established brands, it is important to remember that each of these companies at some point began with humble roots. If you can come up with a creative brand-centric domain name, and want a customer to remember your brand, then that is definitely an option, but be sure to pick one that is unique and reflects your brand’s business. The Brainstorming Session – Most businesses are not run by a single individual. If you have a team of people, bring together all that brain power to one spot and spend time bouncing ideas and keywords off each other. If you are a sole business owner, see if family or friends can aid you since they likely have spent enough time discussing your business with you to have an idea of what your goals and missions are. Write down the domain names of your competitors or companies in similar businesses within your space. Weigh the pros and cons of each name and discuss how effective they are at communicating their product or service. Be broad and be bold – Do not be shy with any idea you have even if it is only slightly relevant to your business. If you shoot down ideas immediately, your team might miss out on a great opportunity, for fear of rejection. Compile keywords – Create a list of all the keywords that are linked to your product or service. Use a whiteboard or a notepad and write down the most common words associated with your brand. If you want your customer to know you for a trait or keyword, emphasize that and play with possible iterations. Use a thesaurus or a dictionary – Using your keywords or buzzwords, you can utilize either a thesaurus or a dictionary to find synonyms or even more accurate versions of the word you are using. Amalgamations – Quite often, one of these keywords by themselves will already be taken, but if you can create a fusion of two words, you might have a better chance of finding an available domain name. Cleverly combining two keywords can help customers intuitively understand what your product is. Take Groupon for example, which combined the words coupon with group. Consider your location or company values – your domain name does not necessarily require your brand name in it, consider your company’s location or other aspects of your business that set you apart from your competitors. Misspellings – Often, your ideal word will already be taken. However, misspellings or dropping the vowels from the word might open up new avenues and also create a cleaner looking version of the domain name. Such names are often easier to type in and easier to remember because of their unique look. Easy to remember/easy to type – You might come up with a great name, one that you think perfectly defines who you are and what you are selling, but if it is not easy for new customers to remember or is a pain to type in to the search bar, you will lose potential customers. Ideally, you want a name that rolls off the tongue and is hard for people to forget. Since many dotcoms have already been taken, many companies are using new creative domain name extensions besides the big seven. While there are some out there that will argue that it is worth it to pay more money for a dot-com address or to purchase a pre-existing domain, others are moving in the opposite direction. In the last few years, “.ly,” “.be,” and “.io” have grown in popularity and plenty of websites have cleverly incorporated those extensions in a creative way. For example, “list.ly” and “postach.io” are growing businesses that have uniquely combined the two to create a clean and memorable name. Creating a domain name that is not only clever and catchy but also available and within your budget range is no easy task. Regardless, it is a critical component of your online business, so it is crucial that you take the time and effort necessary to land on the right domain name. By doing so, you explore new avenues that may lead you to a domain name that sets your brand in motion. Your domain name can be regarded as your first impression on the internet. And just like first impressions, you want someone’s first encounter on your website to be perfect. Put the time and effort necessary into choosing your domain name—it’s important.